More than 90% of the population of Xuan Giang commune in Ha Giang province is Tay ethnic minority people. Local authorities have established Folk Artisans’ Associations to preserve and develop their traditional cultural identities, especially as it relates to folk melodies and musical instruments. 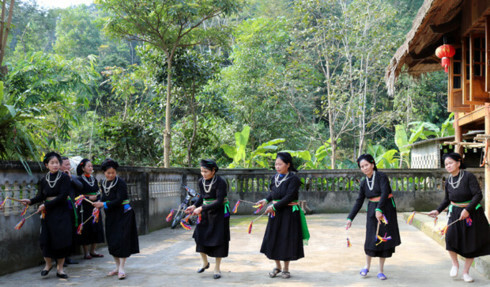 Then singing, Yeu singing, and call-and-response singing hold many spiritual and societal values and are among the cultural treasure troves preserved by the Tay ethnic group in Xuan Giang commune, Ha Giang province. Village boys and girls attend festivals like the Long tong, or Going to the field festival, and the full moon festivals in the first or the seventh lunar month, to have fun and find friends with whom to perform call-and-response singing or singing of folk melodies. On that day, many adults and children gathered in the spacious stilt house of Mr. Hoang Van Binh, Chairman of Xuan Giang commune Folk Artisans Association, to learn singing and playing musical instruments. Bính said the Association was established in 2012 with more than 30 members. A majority of them are village patriarchs who still remember traditional folk melodies and traditional crafts. To date, the number of members has increased to nearly 100, living in nine surrounding hamlets. Every month, in addition to teaching traditional craftsmanship, artisans also teach singing and dancing. The communal Folk Artisans Association has organized courses to teach singing and dancing at schools, especially during summer vacations. Hoang Thi Thap of Quyen hamlet said although the association doesn’t have an operating expenditure, the artisans by virtue of their passion and enthusiasm have arranged by themselves free classes for children to learn singing and dancing. 16-year-old Hoang Thi Nhu Quynh of Quyen hamlet said she and other local children feel enthusiastic about discovering the traditional culture.